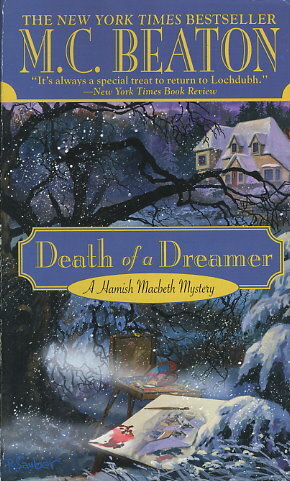 DEATH OF A DREAMER BY M C Beaton is 247 pages in hardcover form. This is #22 in the Hamish Macbeth series set in Scotland. This is a book that you can read in an afternoon because it is a short book and filled with all kinds of interesting characters. I love the way poor Hamish has trouble with the women. I really loved every minute of this book. It had the regular towns people of Lochdubh as well as some incomers. Of course the incomers are the ones that always get into trouble and it is up to Hamish to sort it all out. Blair was injured at the very beginning of the book, so wasn't in this book too much. Jimmy was in charge and left Hamish to his own way of doing things. Some interesting things happened in this one to set-up the next one. I really like the addition of the cat that plays with Lugs. There are just so many interesting characters, I keep reading the series to see what each one is up too. I am giving this 5 out of 5 stars and can't wait to read the next one.